Superior Performance and Versatility: Users can choose from 12 different standard waveforms. Arbitrary waveforms can be generated up to 128 K in length at high sampling rates. On pulse waveforms, leading and trailing edge time can be set independently. External signals can be connected and added to the output signal. Dual channel models can generate two identical or completely different signals. All instruments feature a highly stable time base with only ±1 ppm drift per year. Intuitive User Interface Shows More Information at a Single Glance: A large screen shows all relevant waveform parameters and graphical waveshape at a single glance. This gives full confidence in the signal settings and lets you focus on the task at hand. Shortcut keys provide direct access to frequently used functions and parameters. Others can be selected conveniently through clearly structured menus. This reduces the time needed for learning and re-learning how to use the instrument. 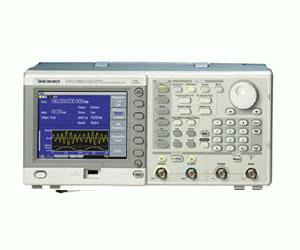 Look and feel are identical to the popular TDS3000 Oscilloscopes. ArbExpress™ Software Included for Creating Waveforms with Ease: With this PC software waveforms can be seamlessly imported from any Tektronix oscilloscope, or defined by standard functions, equation editor, and waveform math.